Remember my “Magical” Christmas Mantel post where I said I redid the mantel three times before I was happy with it? Well, it’s four times now. It’s a sickness. I can’t help myself. 😉 THIS is the final mantel. The Bell Garland came from my friend CereusArt. Check out her Etsy shop for really cool coastal decor accessories and beach themed gifts! Posted in DIY Decor, FYI (ideas & info) and tagged Christmas, Christmas decor, Christmas decoration, Fireplace, Fireplace mantel, Holiday, holiday decor, holiday decorating, Home, mantel, Ornaments. Bookmark the permalink. But we did get the Christmas lights up outside, and the house and tree was decorated to the sounds of Trans Siberian Orchestra. 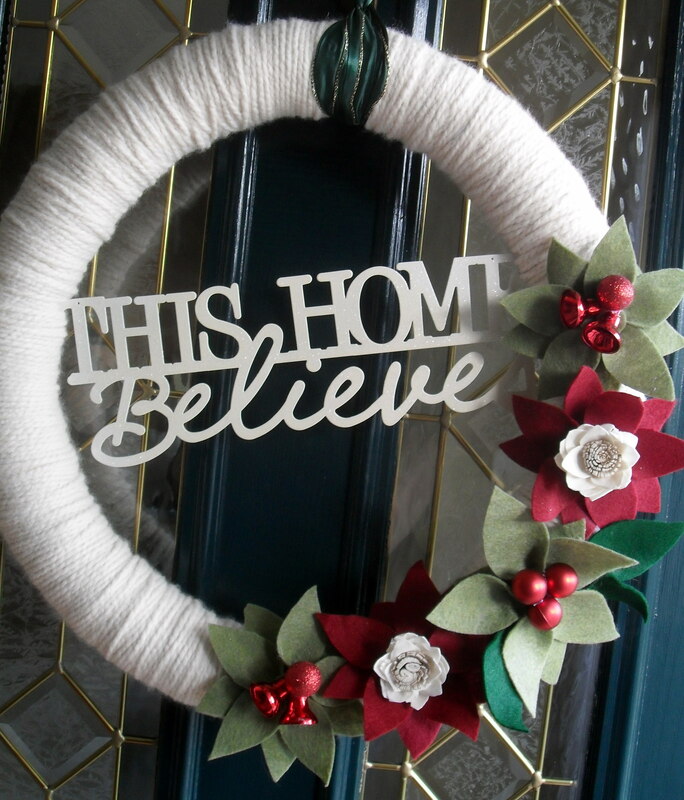 I made a wreath for the door inspired from ideas I have seen on Pinterest. The wreath started out as pool noodle that I ducted tape together and wrapped with yarn. The “poinsettia” are made from felt, decorated with small christmas ornaments and dried flowers. Tis the season! Posted in SOS (tutorials) and tagged Christmas, Christmas and holiday season, Christmas decor, Christmas decorating, DIY, Holiday, holiday decor, Pinterest, Wreath, Yarn. Bookmark the permalink.